Celebrate your #1 mom, sister, or daughter with their very own mini medal. Winning gold in the 100-meter dash is pretty amazing. But winning at being an amazing woman? That's downright inspirational. 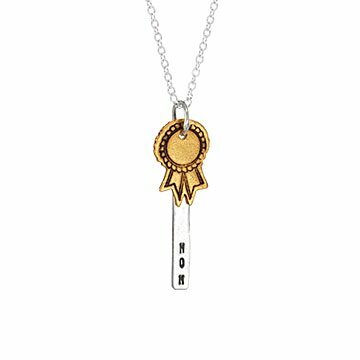 Honor your #1 mom, sister, or daughter with Christine Street"s playful award necklaces. A tiny gold vermeil medal lays overtop a sterling silver charm with "mom," "sister," or "daughter" etched into the bottom. It's a subtle, thoughtful way to thank her for all she's done, which is too long of a list. Handmade in California. 1.13" L x .34" W, Chain: 18"